The last encounter at Galabank between these 2 teams saw Annnan grab an injury time penalty to secure the points and this match had a similar outcome with Annan lifting the points with an injury time header from Martin McNiff. The defeat for the time being keeps on hold East Fife’s hopes of securing the final play off place and the victory for Annan keeps alive their faint hopes of making the play off’s with 2 games of the season remaining. Annan’s form has been erratic all season but their home form has been very impressive but after a lack luster performance against Queens Park last week and a dismal performance against Clyde on Annan’s last home outing the fans could be forgiven for wondering what Annan team would turn up for this week encounter. Well within 2 minutes Annan went ahead and gave us all an idea of what was in store for the reminder of the game as the match turned out to be an enthralling encounter with both teams going all out for victory. The opening goal was well created with Annan forcing an early corner kick and Andrew Mitchell’s corner fell to Ryan McStay who finished with great effort from the edge of the box which went through a ruck of players and past keeper Allan Fleming to give Annan an early advantage. The game then swayed from end to end until the 14th minute when East Fife squandered a golden opportunity to square the match. The fifers broke swiftly from defence and all of a sudden the Annan defence were left exposed after Nathan Austin all of a sudden found himself one on one with Steven Black, Austin outfoxed Black and as the two men collided the Fifers were awarded a penalty kick. The spot kick however was a dreadful effort from Fraser Mullen whos shot skied over the bar and into the roof of the enclosure . It was a real let off for Annan and minutes later Jordan Hart pulled off a fine reflex one handed save to deny Kevin Smith as the visitors maintained the pressure on Annan . 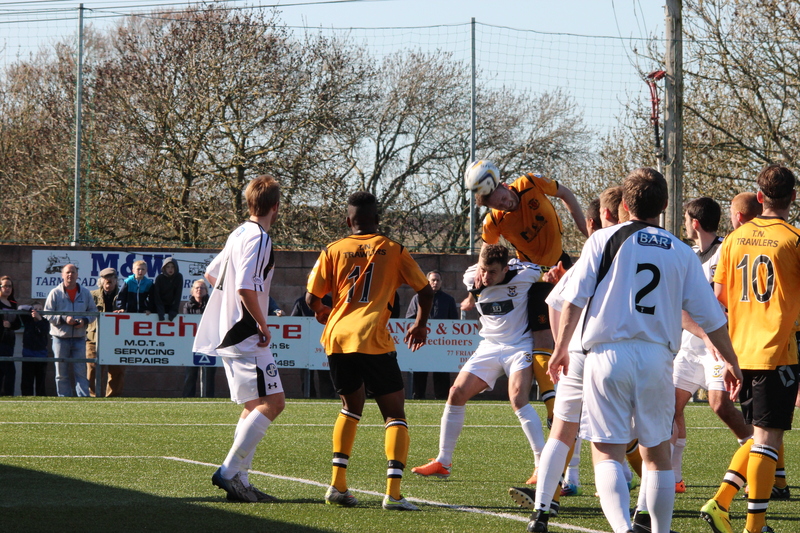 The Annan keeper however had no chance with East Fife’s eqauliser in the 39th minute. The goal was created down the right when Julen Etxapegoren Leamzbarrotia picked the ball up in his own half and forced his way down the right finishing with a pass to Nathan Austin who picked the ball up on his right had side before cutting back jinking past the challenge of Black and finishing with a vicious left footed shot past Jordan Hart to square the game. As the game edged towards half time Annan started to impose their authority on the game and they won a free kick in a promising position just outside the box after Ogen was fouled by Mullen but Weatherson’s effort failed to hit the target and a promising opportunity was lost. At the other end Jordan Leyden came close when his shot slipped narrowly past the post. Annan finished the half with a flurry when Todd combined with Ogen who’s well placed shot was saved the legs of keeper Allan Fleming for a corner . Annan’s injury woes which has plagued them all season continued at the interval when Steven Logan replaced the injured Andrew Mitchell at half time. It was East Fife however who started the second half the better with the impressive Nathan Austin coming close with a low strike which flashed past the post. Logan was denied a goal when his well struck net-bound shot was headed past the post by Jonathan Page. The game swayed from end to end and in the 66th minute Austin and Smith squandered a good scoring opportunity with Hart conceding a corner kick. Dickson and Austin combined in the 70th minute for the latter to send in a low shot as the visitors went on the offensive. Watson conceded a needless free kick wide on the right when he bundled Kevin Smith on to the bye line and from the resulting kick it was Smith who headed wide. The game continued to swing from end to end with McNiff’s header form a corner going narrowly past and at the other end Kevin Smith shot past . The match appeared destined to end in a draw until Annan struck with the injury time winner. Annan forced a corner down the left the ball broke wide on the right and Steven Black atoned for his earlier mis-deamer to float in a great ball to the back post and Martin McNiff rose unchallenged to flight the ball into the top corner of the net. ANNAN ATHLETIC: Jordan Hart, Steven Black, Steven Swinglehurst , Martin McNiff, Peter Watson, Steven Sloan, Andrew Mitchell ( Steven Logan ht), Ryan McStay , Peter Wetherson, Josh Todd , Junior Ogen. Subs not used Alex Mitchell GK, Jordan Brown, Chris Dickinson, Connor Liddell, Rabin Omar, Dan Wadge. EAST FIFE : Allan Fleming, Gary Naysmith (Lewis Barr 78 minScott Smith, Julen Etxapegoren Leamzbarrotia, Jonathan Page, Fraser Mullen, Sean Dickson ( Alan Cook 70 min), Ross Brown, Nathan Austin, Kevin Smith, Jordan Leyden. Substitutes not used Jordan Miller GK, Caolan McAleer, Nathan Aistin, Derek Riodan, Ola Adeyoma . The season is reaching an exciting climax Albion Rovers have lifted the title coming back from a 2 goal deficit to defeat Clyde 3-2 at Braodwood and with Montrose defeating the in form Elgin City 2-1 and Berwick Rangers inflicting a 4 goal victory over East Stirlingshire it leaves 4 teams East Fife, Elgin City, Annan Athletic and Berwick Rangers in with a chance of making the play offs with East Fife knowing if they win their last 2 matches they will reach the play off but with all the teams to play each other it is certain to go to the last match of the season before the final play off place is determined. Next weeks matches Elgin City v Annan Athletic, Berwick Rangers v East Fife, Sat 3rd May Annan v Montrose, East Fife v Elgin City, Arbroath v Berwick Rangers.